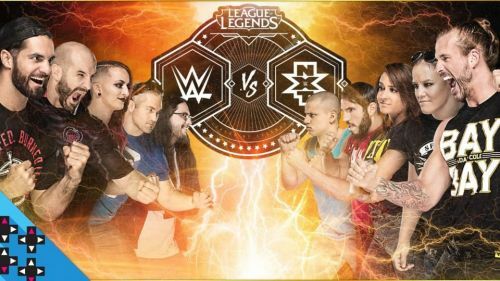 League of Legends recently collaborated with World Wrestling Entertainment for a show match of League of Legends. The initial news broke out when famous streamers Tyler1 and Imaqtpie kept indulging on trash talks with each other. The duo took the rivalry to the next stage by collaborating with WWE. This was followed by a quick announcement by WWE that an exhibition match will be held between the two streamers and both the streamers will lead a team full of WWE superstars. Get the latest LoL News at Sportskeeda. A face-off took place in which the entire squad of both the teams was revealed. The face-off took place in the ring of NXT as both the team trash talked each other. On 18 November both the team faced off each other in a League of Legends match. Team NXT was lead by Tyler 1 and it featured Adam Cole, Dakota Kai, Shayna Baszler, and Johnny Gargano whereas Team WWE was led by Imaqtpie and it featured Cesaro, Ruby Riott, Tyler Breeze, and Seth Rollins. The game was pretty one-sided from the beginning. Team NXT got to a fantastic start since Team WWE donated a bunch of kills. The game completely snowballed from there as team NXT rolled over Team WWE. Kai and Cole performed exceptionally well as they ended the game with a KDA of 13/1/5 and 10/2/4. On the other hand, Seth Rollins who was playing Teemo mid ended the game with a KDA of 0/15/1! League of Legends has one the highest learning curve and even after that the professional wrestlers managed to do decent after a very few practice sessions. The match was streamed in the youtube channel UpUpDownDown. The channel is handled by Video game enthusiast and professional wrestler Xavier Woods. The collaboration shows how much potential Esports industry has in general. Many big names have joined the industry is some way or another in the past few years and it will only go up from here. For all the latest Video Game News, tune into Sportskeeda.